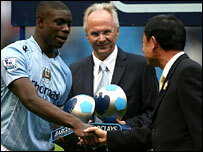 It was a proud moment for me to captain Manchester City against Aston Villa on Sunday. I wouldn't say I was expecting it but, when we had a pre-season match in Sweden and Dunney (Richard Dunne) was injured, I was captain then - so I was kind of hoping this time but I didn't know for sure. Sven-Goran Eriksson didn't really say a lot to me about it. He only told me the day before the game and just said: 'you are captain - make sure you are ready' in a jokey sort of way. It was a nice feeling but the captain's armband is just on loan really - Dunney has been class for us all season and he will lead us out against Fulham on Saturday. Hopefully I will become City's permanent captain one day but I don't think I am ready for the job just yet! I was just delighted to get the Barclays Player of the Month award for August too. A few of our players could have won it to be fair though - we have all been outstanding - and it is not just me who should take the credit, it is down to the whole squad. I was going to go and watch City's on-loan striker Ishmael Miller play for West Brom on Saturday but we had to be in our hotel in Manchester by 6pm (1800 BST) and I wouldn't have made it. He has made a big impact since going there and I am sure he can do the same at City when he comes back. It is all about confidence for a lot of strikers and his was down last season. But since he has gone there he has been banging in the goals and it is another big compliment to our academy. Someday he will be a top-class Premier League striker and maybe even better than that. It is weird coming back from international duty - I didn't get home until 2am (0200 BST) on Thursday and had to come in to training that day for a warm-down. Then you are building up to the next match and it is hard to get back into the swing of things but, once you get back on to the pitch, it is back to reality and you just play the football that you are used to. 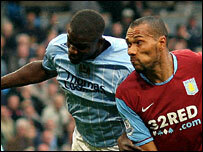 Villa striker John Carew is one of the hardest opponents I have faced this season - it is impossible to dispossess him sometimes. You think you have got the ball and then he puts out a shoulder and you have to adjust your position. I enjoy testing myself against all sorts of different players - fast, big or skilful! Against Russia for England last week they had a really good left winger in Diniyar Bilyatedinov too. He wasn't just about pace but had good feet as well. But the trickiest player I have faced so far was Arjen Robben at Chelsea at the start of last season. His movement was just incredible. You have to treat every trophy with the same respect and I think the manager will play his strongest team in the Carling Cup against Norwich on Tuesday. I was rested in the second round against Bristol City but the only reason players were left out was because of the amount of games we played in a short time at the beginning of the season. 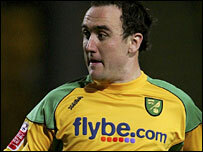 Norwich winger Lee Croft is another player who I was in the academy with at City and he has already sent me a few texts to let me know he is coming back. It can be a bit of a setback for some players when they leave City for a different club but Lee is doing well down there and is one of their main men. We have had a bit of banter and I am sure we will have a couple of run-ins with one another on the night - but I am sure it will be a good game and hopefully we will win! I am on the internet all the time. As well as this column I have got my own MySpace page too - quite a few players have them. I have actually been getting a bit of stick from one of my old teachers - Gareth King, who used to teach me PE - who has been reading my comments here - we still keep in touch and he comes to watch a lot of my games so I thought I'd better give him a mention! I have been enjoying looking at all the questions you've been asking me and hopefully I've answered a few of them for you too. Keep them coming!